As winter descends at last upon the northern hemisphere, we at Earth Mantra don our soft flannel pajamas, curl up in a big comfortable blanket, fill our cup with piping hot tea, and ease ourselves back in our listening chair for another season of delightful ambience. Our favorite time of year is the cold months, when the winds outside blow fierce from the arctic north, but inside we relax snug and warm, the perfect setting for ambient music. 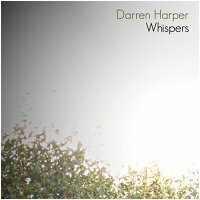 And amid this setting, along comes the newest release from Darren Harper, called Whispers. Shorter than his usual fare, clocking in at only forty two minutes and change, this release nonetheless perfectly mirrors our love for the winter, a wondrous sound track for contemplation as the temperature falls. Darren describes the release as a collection of "transition pieces", which still carry a bit of summery warmth but with anticipation of autumn's chill. He reports that as he composed the pieces in September of 2010, the scenery where he lives in the foothills of the Rocky Mountains changed quickly, from mild warmth to sudden snow, something Darren lovingly interpreted in this music as "whispers of a changing season". Indeed, the sense of enigma and change can be found everywhere in these pieces, echoing the passage of time and the winter transformation of the natural world. Musically, these pieces could be described as lighter drones, with chimes, suspended synths, piano, and acoustic guitar, but really we would simply call them sublime. The sounds drift soothingly along, like leaves blowing quietly in the wind, with a constant sense of direction but imposing no requirement on the listener to ascribe any purpose at all to the music other than repose. Ambient music comes in a lot of forms, but one of our favorites is the pure undiluted kind, the ambience that just 'is', in a very present and zen-like sort of way. We consider Whispers a nearly perfect example of such a creation, the kind of music that becomes a constant companion for those quiet times as the skies grow dark and heavy with snow. So with great pleasure we unveil the latest release by Darren Harper, an album of great beauty and profound depth. This is a release that we are very proud to bring to our listeners on Earth Mantra, and one that leaves us hoping for much more from Darren in the future. This is truly beautiful, restful and sublime. Thank you! I really like this. Nice music drawn with careful brush-strokes. Drones, of course, which I love. And it fits the theme nicely. A quality release.